Record for Louisville hosting Cincinnati yesterday. Big showing for home crowd and traveling crowd and great for the league. Orlando Rays, Matthew Johnson and msilverstein47 repped this. 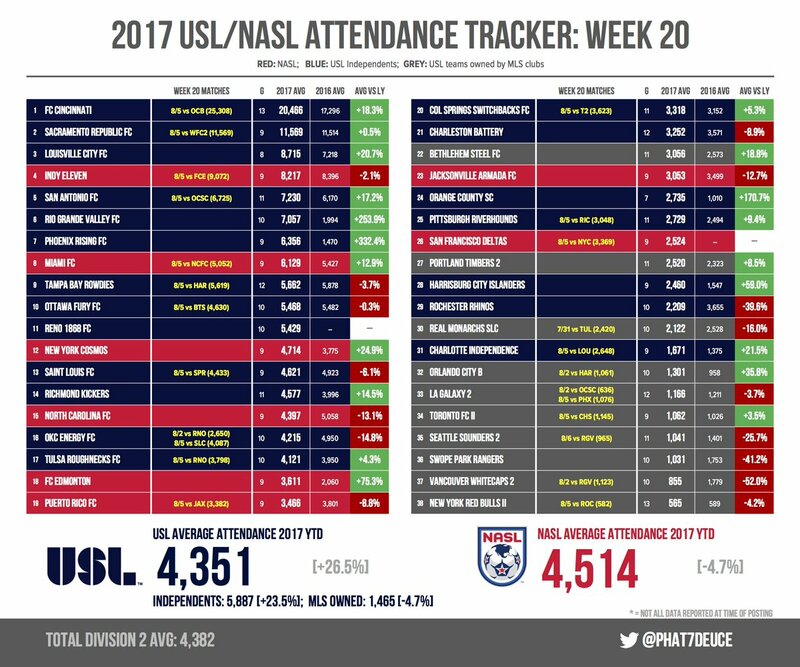 FC Cincinnati now flirting with possibly 20,000+ average for the season. I think they can pull it off assuming don't have terrible weather rest of the year. 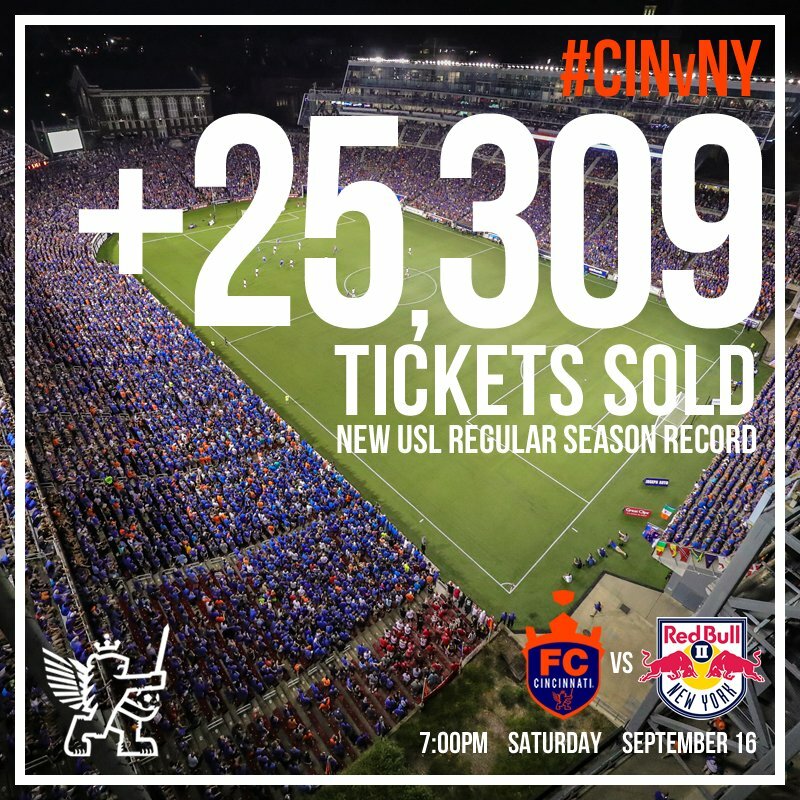 25,308 in Cincinnati last night marks a new record for USL regular season match. 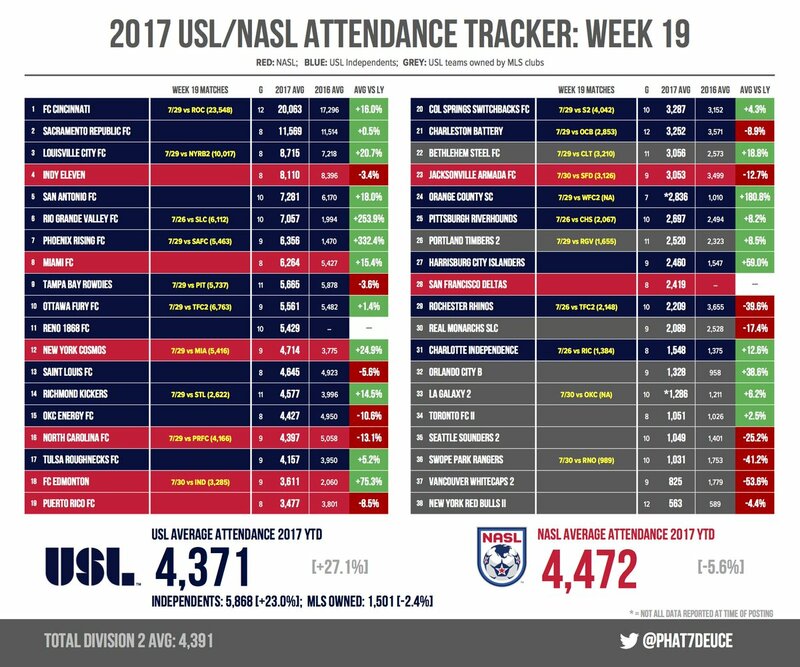 The USL passed the 1.5 million mark in attendance as Wednesday's five games drew an average of more than 9,700 fans. FC Cincinnati's crowd of 20,058 at Nippert Stadium for its 3-1 win over Ottawa was higher than the crowds for four MLS games. AZUL GALAXY and Traumer repped this. 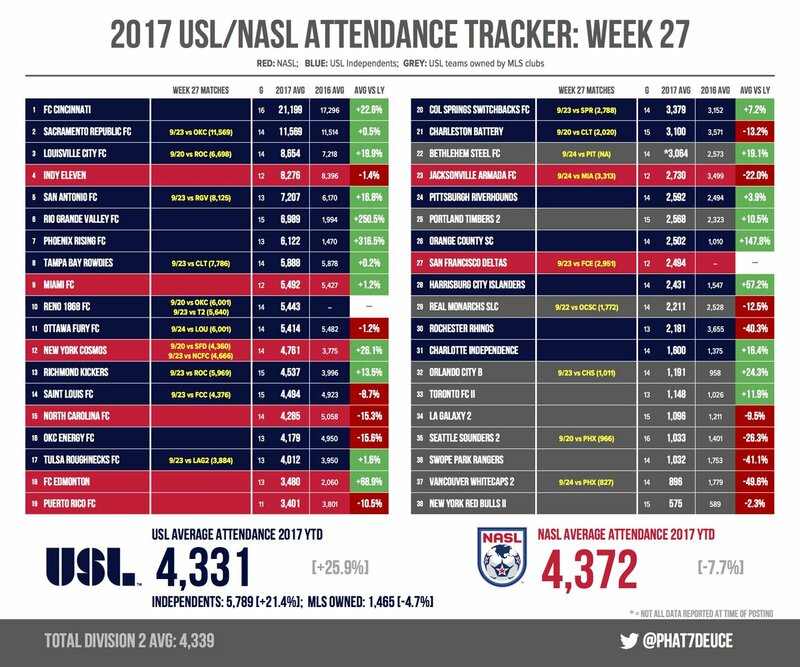 I wonder if USL will overtake NASL in attendance by the end of the season. The gap has been narrowing for quite some time. Traumer and artml repped this. Right now Cincinnati expects in excess of 20,000 for Pittsburgh match and possibly 30,000 for New York match. We should settle our average around 20,000-21,000 range. Not sure how much that affects the league number. Combined DII table has eight USL teams in the top ten. 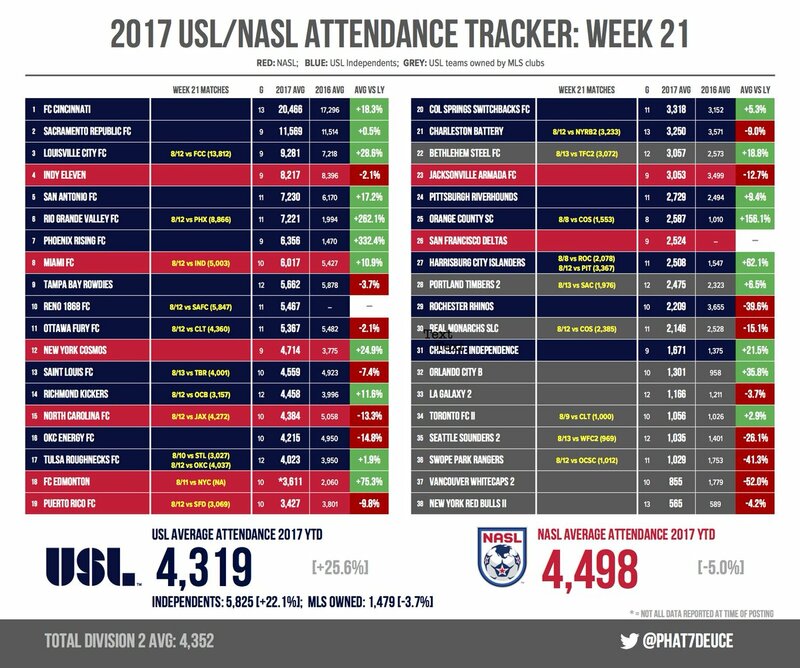 Making a big push to get 30,000+ for the last home match this season. 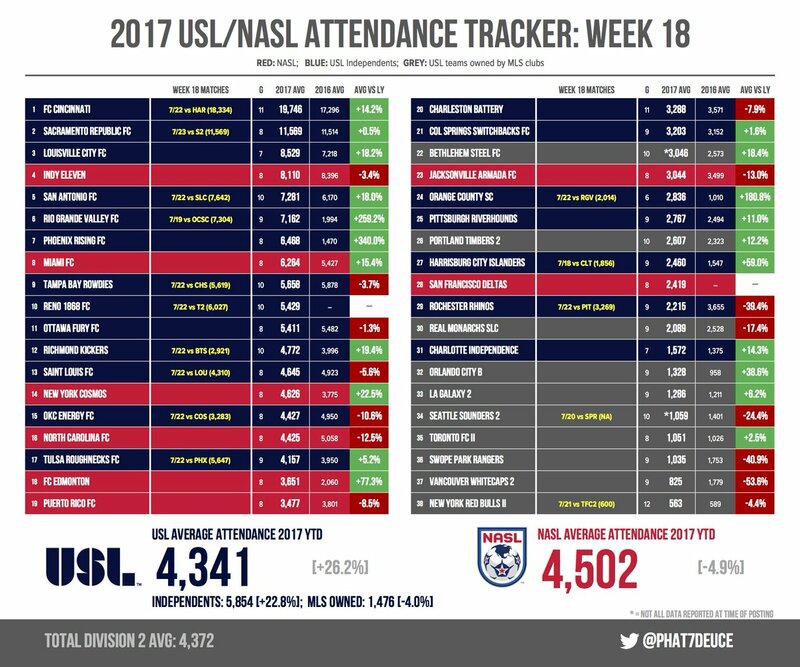 30,417 in Cincinnati for a new USL record. artml and Tobias C repped this. Saw this and realized Saturday also apparently marks a new D2 record over all. Yes, that is a new D2 (standalone) record. Should have been more clear. Minnesota United announced 34,047 for a doubleheader in 2014 with Olympiakos against Man City in the other game on August 2, 2014 that remains the official record. If we are going to be consistent on such things, that's the record, even though no one believes that many stuck around for the United match. Looking ahead to 2018 a little. I read that Sounders 2 will move to Tacoma and that perhaps another "2" is going to Omaha? Such moves should help attendance average. 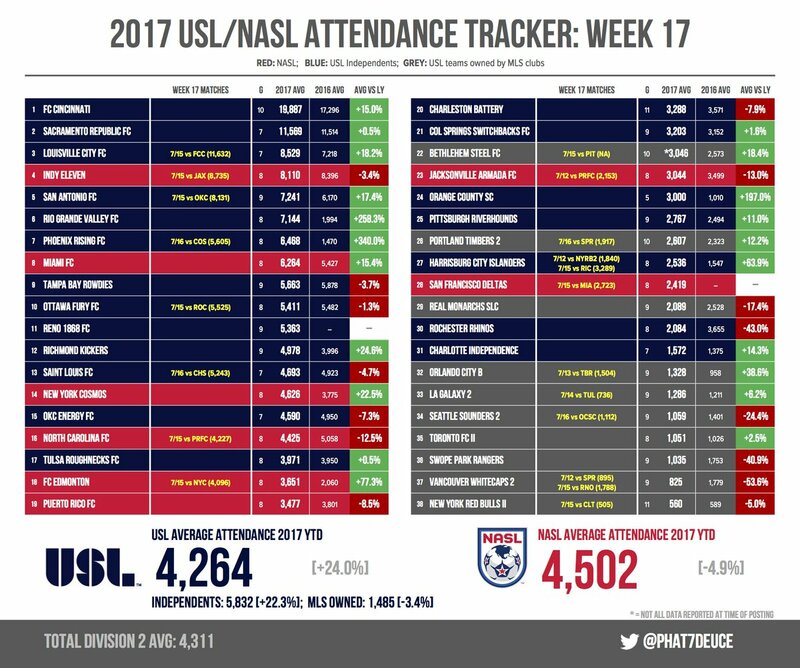 Besides expansion, any other attendance thoughts heading into 2018? 1. Can increases in 2017 be sustained in 2018? 2. How will expansion sides affect numbers? 3. Will more NASL sides move over to USL? 4. Will MLS expansion announcement help/hurt USL sides in contention? 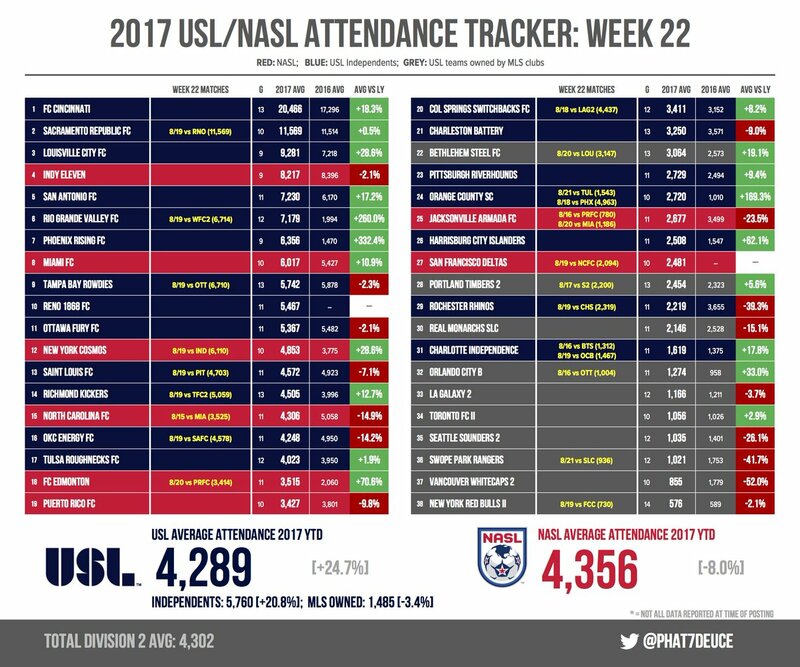 I do think the handling of "2/B" sides will be huge for the USL's floor of attendance. I could see a 1000 or so increase in numbers for many of those teams if they are marketed in their new cities. Montreal shedding its "2" team in favor of NASL to USL Ottawa helped numbers. Half the teams in the league have completed their home schedules. 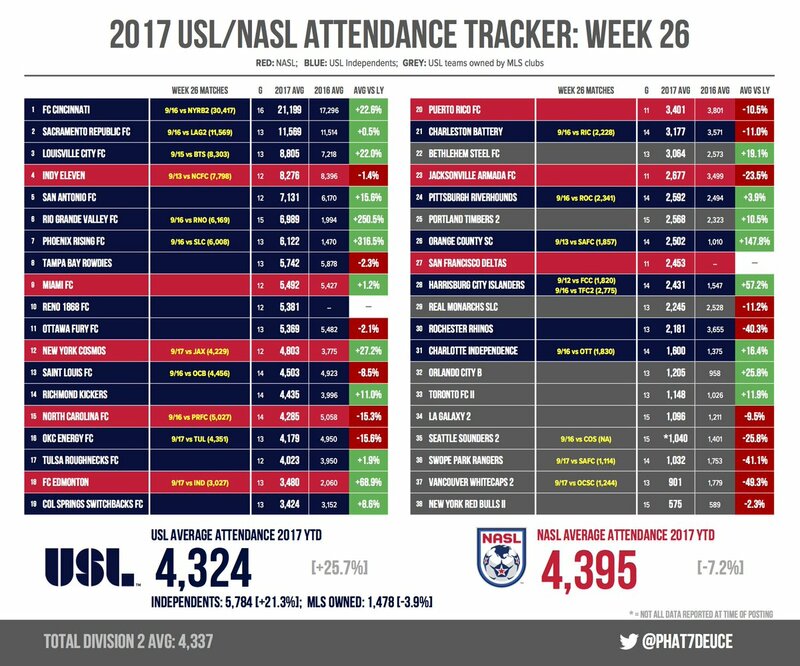 Here is the year-over-year percentage increase in average announced attendance for those clubs. As for 2018, RGV isn't going to see another 254% increase, nor is Orange County likely to see a 150% increase again. Even if Seattle moves somewhere and "is marketed," their share of what will likely be a 544-game (or so) universe within the league can't move the needle much by itself (only maybe 33 people per game throughout the league). You'd also hope that getting rid of Vancouver while adding Nashville, Fresno, Vegas will help the "average" as well. As long as more expansion teams pull in more than the average than not, you hope things trend the right direction ... just likely not as fast due to volume issues.